I try not to knock the countries whose food we cook, but I have to admit I've generally found Central American food to be pretty boring. The Nicaraguan food we cooked mostly fits the pattern, with one huge exception: enormous, overloaded, rich nacatamales. The variety of ingredients, from raisins to olives to rice to pork, is so enshrined in each family's recipe that it's like canon; as one fourth-generation nacatamal vendor put it, "We don't innovate. We make everything step-by-step the way we were taught." Joining in our attempt to avoid innovation were Emily (and Stella! 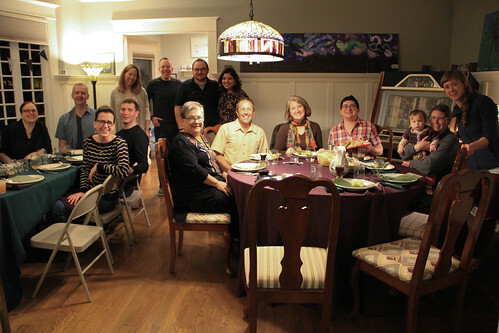 ), Courtenay, Courtenay Hameister +1 Elia, Julie, David, Nancy, Sue, Kaely, Brett, and friends. Muchísimas gracias to Emily for her guidance in all things Nico — that is, Nicaraguan. There's a surprisingly broad range of non-alcoholic drinks in Nicaragua. Emily brought over a premixed cebada, a barley-based drink, while I whipped this one up from scratch. Well, sorta. I bought whole tamarind pods and tried to soak and strain them, but they were super old and tough, so I cheated and used an Indian tamarind concentrate. Way easier! I put the chia on the side, because not everyone enjoys boba-like texture in their drink. It's odd how sometimes a very particular combination of foods becomes a common thing, almost like someone's late night fridge raid accidentally got enshrined in the national culinary canon. 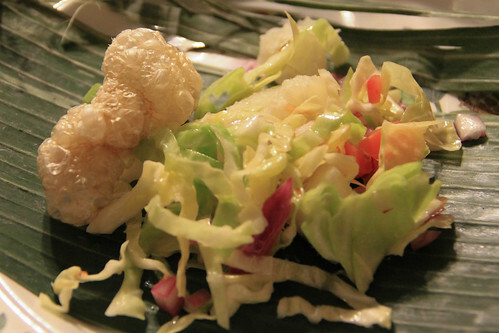 In this case, it's plain boiled yucca root with a mildly tangy cabbage slaw and fried pork rinds, wrapped in a banana leaf. 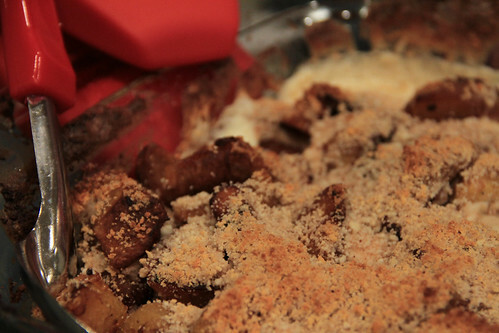 It didn't do too much for me, though it was fun learning to make chicharrones from scratch. I am a huge fan of Mexican food, but I'm just not a fan of the tamales, most I've had are pretty dry and almost all corn with just a bit of some filling. The Nico version, on the other hand, is rich and just about bursting with filling. To start, the pork is great just on its own, in a vibrant red sauce. I was stoked to find the sour oranges fresh at Providore, and since every recipe called for a different cut of meat, I went with pork shoulder because I needed the skin for the chicharrones, and the generous layer of fat for the masa. Now that's how to avoid a dry tamal, just douse the corn in lard! 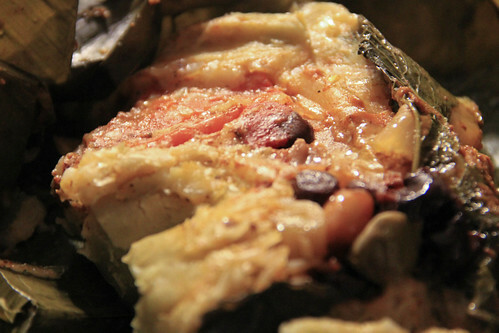 The third component of the tamal is all the other random stuff you fill it with: rice, potatoes, tomatoes, onion, mint, olives, prunes, raisins, peanuts, capers, and chiles. You practically clear the pantry! Then it's all assembled on top of banana leaves — which themselves contribute to the flavor and moisture — wrapped and steamed for several hours. Oh man, I loved these! So much flavor and color, so many textures, every bite a little adventure. They're so filling that I can hardly believe that the traditional accompaniment to a nacatamal is, I kid you not, bread. Very similar to the Costa Rican version with which I'm more familiar. 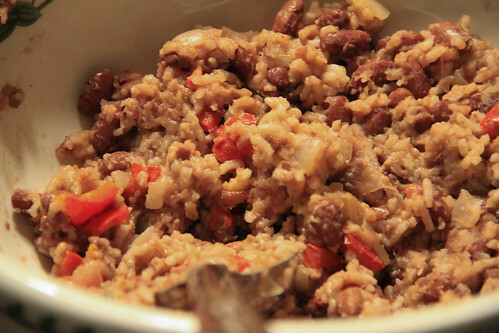 According to Emily, this recipe was fancy compared to typical, which should be little more than leftover plain rice and beans, stir-fried. That said, this still didn't have a ton of flavor, the tamales were way better. In extreme contrast with the Spartan plainness of gallopinto, this dish lives up to the name that literally translates as "ripe ones in glory." The ripe ones in question are fried sweet plantains, and the glory is layers of cultured cream and sweetened salty hard cheese.